The small cracks that have appeared in recent weeks became gaping holes last night as a physical Colchester side exploited our defensive frailities and lack of Plan B. Yes when we can dominate teams by passing the ball precisely and quickly then we have looked unplayable but then as we are finding out better organised team's who play to brute strength come along. To be fair to Colchester, they have a decent side and a very good manager. Aidy Boothroyd out-thought Parkinson by pressing us deep into our own half, stopping the link-up play thus eliminating our wingers and isolating Burton up front. Pretty simple really but a kick in the teeth for Parkinson's tactical ability. After reading Nelson's preview of the game yesterday I was apprehensive of our (and Parkinson's) record against both Colchester and Boothroyd, as well as the Lisbie factor. He didn't score but was a thorn in the side all night playing a role out on the right hand side. Combine this with what Bradley Allen described on the radio as the ugly way to play and our defence crumbled. Llera to fair has been an accident waiting to happen and last night he's had the preverbial 'mare. People clamouring for Sodje I expect will get their wish on Saturday, but then of course he goes off to play for Nigeria in a World Cup qualifier. We obviously miss Semedo as he reads the game so well in advance particularly at this level. To have a chance we need him back in the starting line-up Saturday. Parky is right to call for us not to overact, we were going to lose sometime and our ten-game record is admirable but it is now time to move on, and look closely at our system and the players that have played it. Saturday presents us with a perfect opportunity to bounce back. Good teams bounce back. Finally credit to the travelling Addicks who sung their hearts out backing the side despite the ground being a god-awful place to get to. Reports: All Quiet; Kings Hill Addick; Blackheath Addicted; Drinking During the Game; Charlton Athletic Online. Another American invention the Baby Shower entered my life yesterday. Just like Sweetest Day and National Boss Day it is another way that greeting card companies can squeeze more money out of punters. I don't yet believe Administrative's Professional's Day has yet crept into the British pschye but Baby Showers certainly have. Some friends arranged the afternoon on behalf of my hugely-pregnant-other-half and ordinarily it is a girl-only event involving cups of tea and cup-cakes. However by starting the way I plan to go on, I wanted full parental participation and decided to invite all the male partners and cancel the PG Tips and provide beer instead. And it turned out to be a successful and fun time held outside on a cracking summer's evening plus we went home with loads of presents. What great inventors those American's are! Talking of whi ch, the White House has announced that President Obama will, as I suggested 10 days ago, travel to Copenhagen for Friday's International Olympic Committee's 2016 decision. Tony Blair's last minute efforts were said to have helped London win the 2012 Games. One of the world's most influential broadcasters and famous Chicago resident Oprah Winfrey will also be in Copenhagen as will former gold medallist's Ed Moses, Jackie Joyner-Kersee and Michael Johnson. Fortunately gobshite Chicagoan Kanye West is not due to appear! Described by one Addick as a dirty win, and certainly we made hard work of it, magnified by a fine 2nd half Exeter display but 3 points is 3 points and I would expect home fans will see a lot more of those kind of games this season particularly when we don't get on the scoresheet early. It's always difficult to judge from the radio but the first 30 minutes sounded like business as usual as we got to work early but the goal didn't come. However Bailey did score at a perfect time just before the break. 2nd half it sounded like we played too deep and encouraged our guests from Devon to gain confidence and the young Noone was causing us many problems, and his surprise substitution gave me a lift sat on the couch. Spring fitted well into Semedo's spot but according to Tim Breacker he should be fit for Tuesday. 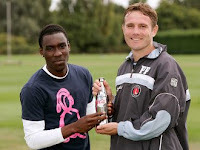 Youga was most correspondent's man of the match and like others I was pleased McLeod got on the scoresheet. I feel he could be a real impact player for us this season but unsure if he would be better starting in a front two or coming on for Burton to stretch opposing defences as games enter the later stages. I am concerned about our recent inability to close games out. Our fitness was being credited early in the season but in recent games players such as Bailey, Sam and Burton have clearly tired and Parkinson does seem like he is hesitant to change players and/or the system during the games (admittedly it nearly backfired at home to Wycombe). Yesterday was the first league game this season that he has used all three subs. Leeds' late winner prevented a return to the top, but I think that result more importantly put some more elbow room between us and Franchise. So it's hard to have too much to moan about, and we need to rally around the boys as we enter a very testing week. Come on you reds. What do Sol Campbell and Paul Scally have in common? The answer is that they both live in a very strange universe albeit one is in a caravan and the other in a flippin' huge mock-tudor mansion. Sol's disappearance from Notts County doesn't have appeared to elicited much media attention, probably because football writers all know he is as nutty as a fruitcake. After Sol left Tottenham for Arsenal in the summer of 2001 I bumped into him holed up in a hotel in Italy, allegedly with a friend. We had a very brief hello and he looked stunned when I recognised him. To be fair without my lenses in a huge giant of a black man stood out amongst lots of little Italian hotel workers. Sol is said to have a very fragile psychology and one can only wonder at what changes in just a few week's after signing a five-year contract in a blaze of glory and cash but then giving it up after 90 minutes at Morecambe? One thing is for sure that other fruit loop Sven-Goran Erikkson will not be able to work it out. My view is that we should now move on and take it onto the pitch when we meet them in October and just let the leprechaun continue to make an arse of himself. Late tonight Charlton announced in much more detail what was leaked in The Guardian last week the re-organisation of the previous club boards and the further injection of money totalling £7m. Not to be sniffed at and we are once again thankful for the continued funding of our great club by a handful of people led by Richard Murray. This announcement I wouldn't think ends any thoughts of a takeover but it certainly tells us that the new Plc board value the club more than any curent prospective buyers. It also safeguards us and our assets including players for quite a bit longer. Of course probably the friendly debt just got bigger but that friendship has become stronger still. The announcement does ask questions that we will probably not get answered but I am pleased the many boards and differing types of directorships has been streamlined. Much easier I would of thought to run and make decisions. The Plc board contains the key financial contributors and I think significantly Richard Murray has replaced Derek Chappell to once again become chairman. 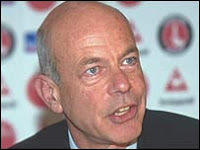 To be an Associate Director back in the day cost £250,000, which frankly didn't pay for Andy Gray's right goolie, so fans with a few quid and wanted to help out such as Cliff Benford and John Humphreys have deservedly been made vice-presidents along with legends such as Derek Ufton and Keith Peacock. The stakes have obviously gotten a bit high for (also legends in my eyes) Roger Alwyn and Martin Simons plus Chicagoan Michael Stevens, Richard Collins and Michael Grade, who was a board member more for his contacts and business acumen than any cash he wanted to throw down the toilet. After getting beat by their biggest rivals Green Bay in the first week of the new NFL season, last night the Bears pulled out all the stops and rode their luck a litle to beat current Superbowl champions, Pittsburgh Steelers 17-14 in the driving rain at Soldier Field after kicker Robbie Gould converted from 44 yards with 15 seconds remaining. Gould's opposite number Jeff Reed missed two closer field-goal attempts in the 4th Quarter. Bermudian TV carries all the NFL games shown on the American networks and the 'football' here is pretty popular with the locals, more so than baseball or basketball I would say. So I settled down to watch yesterday afternoon's game and it was a superb victory for the Bears playing against a lot of expert's (i.e. not me) pick to regain the 'world' title. After a less-than-stellar debut last week by new Bears quarterback Jay Cutler he looked more the part yesterday throwing for 236 yards and two touchdowns one collected by rookie Johnny Knox. A point won, or two lost? Two points thrown away? A well earnt draw? Old defensive lapses coming back? Or a solid defiant performance? Whichever way you look at it, I would have happily taken a battling 2-2 draw yesterday morning. Sure my head sunk and I had the hump at the final whistle but the Canaries deserved their point and we go into the 8th week of the season unbeaten, in the top two and with tough opponents such as Brentford, Southampton and Norwich all played. Despite the radio commentators rather blasé approach to the final minutes of the game - they reckoned that Norwich had ran out of ideas - I was flinching at every Norwich attack as they continued to have their tales up despite the clock running down. McLeod perhaps should have finished the game, but we simply did not keep enough possession and close out the game as we have in previous matches. Norwich however are a class up on every other side we have faced this season. The first half was almost exemplary. From a Jonjo corner a fine header from the on-fire Deon Burton put us ahead and after that our midfield five controlled the game with Semedo seemingly immense. Then on a perfect counter-attack Lloyd Sam put in a peach of a cross for Shelvey to head home. 2-0 and sailing, but the advantage was halved annoyingly just before the break by a player I have always rated, Wes Hoolahan who smashed home after a quickly taken throw left us flat-footed. The 2nd half was nearly all Norwich but for 45 minutes we held firm, our defenders getting good praise from Clive Walker on the radio. Elliot saved well from Smith and after great work by Youga, McLeod had a one-on-one he should have got on target but the Canaries kept coming and it took a dubious and fortunate goal by Holt to grab a draw. Norwich fans celebrated like they'd won the cup, which tells us something. Onto the next game with our pride intact. Reports: Drinking During the Game; Charlton Casual; Doctor Kish; Uttlesford Addick. How very predictable, that midget Scally having a go in today's Kent News about the loan move of Chris Dickson to Bristol Rovers. Scally appears desperate to build some sort of rivalry between us and them even though historically there has been more of a big brother, little brother kind of relationship. Our game at Priestfield at the end of October should be interesting. Dickson scored twice yesterday for 3rd placed Bristol Rovers, both goals coming when he got behind Brentford's defence chasing long balls. The rights and wrong's of Dicko's move to Rovers will continue to be debated but their long-ball style will suit Dickson far more than our more measured approach. What was it with ex-Addicks' getting on the scoresheet yesterday? 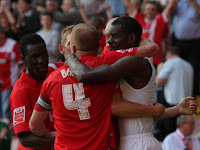 Andy Reid set up Darren Bent's 5th Premier League goal in their eventual defeat to Burnley. Up and coming prospect Kevin Lisbie got two penalties for Colchester, Charlie MacDonald got Brentford's consolation against Bristol Rovers, Jerome Thomas got the Baggies fifth in their absolute thrashing of Middlesbro. Darren Ambrose got Palarse's winner at home to Derby in front of a huuuuge crowd and does Wade Small count as an ex-Addick? If so he scored for Chesterfield. It was over 4 years ago that IOC president Jacques Rogge called out London's name as the host city for the 2012 Olympics, and it will be the same man who will announce which city from a shortlist of Rio de Janeiro, Tokyo, Madrid and Chicago will host the 2016 Olympics following the voting of the 107 International Olympic Committee members in Denmark in 14 days time. 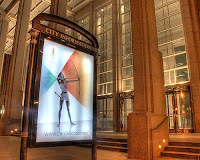 We all know the the choosing of Olympic cities is generally a political gallimaufry of political pay-off's and pay-backs but the Chicago delegation to be led by Michelle Obama will be in Copenhagen on October 2nd with as much chance as their rivals to win the right to host the Olympic and Paralympic games over a 6-week period in the summer of 2016. The 107 IOC members vote by secret ballot, with the candidate getting the fewest votes eliminated in each round until one city secures a winning majority. London as you will hopefully happily remember beat Paris by four votes when decided in July 2005. I think there is still an outside chance that President Obama will show in Copenhagen for the decision, Brazilian President Luiz Inacio Lula da Silva and Spanish King Juan Carlos are both attending and Japan's new Prime Minster Yukio Hatoyama is being urged to go. President Obama stated that urgent US Healthcare reforms need to take precedent so is sending his wife instead. Mind you Mrs Obama, or the First Lady as she is now called, is an impassioned speaker and a Chicagoan through and through and I would hope her more natural character will win over voters more so than stuffy career politicans. Rogge said there are no favourites and it will be close. "I think the final vote will be decided by a couple of votes only." However GamesBids.com, an authoritive website which examines the bidding process showed Chicago lagging slightly behind the emotional favourites Rio de Janeiro in the race - the Games have never been in South America. Paris in 2005 were also the favourites if you remember, and I know that Chicago's 2016 Committee are more than happy not to be out front in the running. Chicago's plan is for nearly all of the venues to be located in the heart of downtown using Lake Michigan as a dramatic backdrop but in Chicago for sure the feeling amongst locals is mixed. Whose going to pay for it? Will the city make a financial guarantee to cover potential losses? What are the environmental issues? Is it just one big ploy to keep the Mayor in office for another term? What about the antiquated transportation system? Just some of the questions being asked but like the majority I really hope Chicago gets it, especially rather selfishly after London hosts the Games four years before. A strange and surprising move this morning for Chris Dickson who has joined Sir Lennie's Bristol Rovers on loan for 3 months. Surprising in that Dicko was heading down the M2 on his way to Gillingham, at least according to their manager Mark Stimson and the ever vexing Paul Scally. And a strange move in us allowing a player to move to a team sat in 3rd place behind us in the table. Time for a little bit of politics, look away now if you have no interest in a government stuck on a rock in the middle of the ocean. Since my arrival just over a year ago I have taken a sideways interest in Bermudian politics if solely for the reason that it is so crooked. Not in a Chicago Champions League bent politics kind of way you understand, but more in a Ryman Isthmian League kind of style. There are two political parties in Bermuda, the residing Progressive Labour Party (PLP) and the opposition United Bermuda Party (UBP). Historically the PLP was a black working class party that originally formed in the 1960's to end racial discrimination and economic disparity following considerable immigration from the West Indies in the decade leading up to that. In 1965 a two-party system was formed with the establishment of the UBP, made up mostly of conservative white Bermudians with some black voters and in 1968 the UBP became the first Government under Bermuda’s new Constitution and then stayed in power for 22 years until defeated by the PLP in the 1998 elections. In the 2003 election the PLP remained in power winning 22 out of 36 seats, but then a cabinet minister named Dr Ewart Brown appeared on the scene and remarkably led a party coup a week later. The two parties agreed to a compromise candidate, Alex Scott, to become Premier of Bermuda, while Brown would hold the deputy premiership but in 2006 Brown made a bid for the leadership and defeated Scott and was sworn in as Premier in October 2006 and has remained ever since, winning the 2007 election and gaining in roughly equal measures sycophants, enemies and those just plain bewildered by his leadership. The PLP appeared to have caused a lot of scars during their time in office led by the dictatorial Brown. The party continues to ramble on about black empowerment and clearly remains committed to the goal of independence from Great Britain but without Brown the PLP would probably still sweep another election tomorrow mainly due to the inefficiencies of the opposition UBP party which has been in freefall for some time. Talk amongst acquainted locals is that the country needs another choice, a 3rd party, well Bermudians maybe about to get their wish. Six MP's from the UBP resigned on Sunday night including the influential shadow labour and home affairs minister Shaun Crockwell, shadow cabinet member Mark Pettingill and ex-party chairman and senator Michael Fahy. Six in total have resigned with a new party obviously on the horizon and sources say up to 20 party members have contacted UBP officers to say they want to follow suit. I don't know about you but I feel a little less pressure this week as a Charlton fan. The 100% record, the Brentford game billed as the biggest game of the day in the country, Pardew's return, Manager of the Month awards.... it was all getting a bit much. I am almost glad the 100% record has gone and Parky and the players can now actually concentrate on each game and not have to cogitate over record books. Norwich City are next up, who after an inglorious start are finding their feet in this division. They lost the other night to Franchise FC but one would assume are vastly more organised than they were under Bryan Gunn. A healthy Addick following will be at Carrow Road Saturday, which is good to see and one hopes the same energised support will make it to Colchester and Leeds as well. The game at Elland Road will be our 11th marking almost 25% of the season gone and perhaps a time when fans with even greater paranoia than me might start to trust the league table. I wonder at what point Parky will make changes to the starting XI, that's hoping injuries won't force the issue although it is obvious that Richardson, Dailly, Bailey and Racon are each carrying minor irks. Sodje once match fit has to be a consideration, as well as young Tamer Tuna who scored another goal in the ressies yesterday. A game that featured Sam Sodje, Leon McKenzie and Luke Holden as well as Jills target Chris Dickson. The man who taught a generation that a fine glass of claret is a must have requisite when you are cooking. Keith Floyd died yesterday at home in Dorset of a heart attack, he was aged 65. Way before television chefs took over the airwaves Keith Floyd led the way with a wonderful and purposefully amatuerish and scruffy BBC series called Floyd on Fish in 1985. His wine fuelled flamboyance and ability to get out and about to talk to normal people dragging good cooking and fancy restaurants into the real world was a real success and he followed this show up with many varieties of Floyd on shows and wrote over 20 books making him a millionaire. Unfortunately he lost the lot on his dream pub and restaurant called The Maltsters Arms in Devon and the snotty nosed arseholes at modern television had no time for the man whom Jamie Oliver called "the best television chef" any more and cancelled further shows in preference for fancy pancy young chefs. His one remaining restaurant is in Phuket. I am sad to see Floyd go as his shows were more inspirational and watchable than most of the 'celebrity chef' dross served up today. One of the greatest ever chefs Marco Pierre White said: "A little piece of Britain died yesterday which will never be replaced. He was an individual, he was a maverick, he was mercurial, he was magical, he was special, he was rare." I will raise a glass tonight in his memory. RIP Keith Floyd. Tonight at 7.30pm the 2nd Supporters' Trust meeting takes place at the Charlton Conservative Club (51 Charlton Church Lane). Please go along if you cna make it. Journalist and radio summariser Tony Hudd and former AFC Wimbledon Chairman Kris Stewart as well as a representative from Supporters' Direct will be there to answer questions. It is thought that around 20% of CAFC shares are held by individuals outside of the PLC, and any future Supporters' Trust would look to gain as proxy as many shares as possible to be able to exercise real influence. Without a doubt I will happily offer my shareholding in the club as proxy to any future Trust. Good luck tonight fellas. Tennis took a bit of a front seat in the Chicago Addick household this weekend. Late last night I tried desperately to stay awake to watch Caroline Wozniacki play Kim Clijsters in the US Open women's final. I have had my eyes on Wozniacki since she won Eastbourne and then the Pilot Pen in New Haven we recently attended so I had a good feeling about the 19-year old Dane and got very decent odds on her winning at the beginning of the tournament. However Clijsters' experience was too much and she deservedly won the tournament in a feel good moment for tennis after Serena Williams embarrassed the sport with her tirade the night before. I hope the USTA stuff the book down her throat. Roger Federer beat Novak Djokovic 7-6, 7-5, 7-5 in a brilliant semi-final on Sunday evening, Federer's penultimate point being an outrageous back-through-the-legs shot hit low and hard leaving Djokovic shaking his head in awe. The man is a genius and he plays the Argentinian Juan Martin del Potro in the final tonight. By the way I also backed Federer and Clijsters in a double. Earlier to get us in the mood for all of this, yesterday afternoon we took a gander at the International Beach Tennis tournament held at Horseshoe Bay and a lot of fun it was too. We have often considered playing weekly beach tennis on a Saturday but a combination of my laziness, my other half's pregnant condition and the searing heat meant we have decided against it. Beach tennis is played on a standard beach volleyball court using a slightly depressurized tennis ball and a paddle racquet. Similiar scoring exists but with no advantage point at deuce and no second service. Beach Tennis originated in Aruba but it is widely played in Italy, Israel and other Caribbean Islands. The Americans snagged it from Aruba but insist on using tennis racquets and not paddles.... those yankees just can't play to the same rules as the rest of us can they? I woke with a bad feeling this morning - an unusally long and dreamy sleep must have given my pschye too long to tinker with my previously confident aura. I was convinced that Pardew's new charges were going to upset us today and the announcement of Lloyd Sam's player and Phil Parkinson's manager of month awards did nothing to quell my unease. Listening to the first half commentary only made me more neurotic as the Saints sounded the better side. The end culminated in a deserved goal for Lallana and at half time I was desperately hoping that Parkinson could deliver a teamtalk equivalent to the one he gave at Brisbane Road. We were out on the pitch first but initially nothing appeared to change. Then suddenly following a quick break out led by an Elliot throw Burton pounced on a defensive error (not for the first time this season) and we were level. The confidence around my sofa and around 3 sides of The Valley grew immeasurably after that as our midfield started to get a grip on the game and Youga, Richardson, Bailey and particularly the previously subdued Sam started to stretch the width of pitch. The game was pretty much throughout littered with unpleasantries though as Pardew's orders to unsettle us were carried out. Racon seemed to get mixed up in it and at one time a melee ensued after a foul on Bailey. The referee who appeared the opposite of a homer according to the commentary team, although a mate later said he was equally crap to both sides, became a central character during a 10-minute spell in the 2nd half. First of all the referee shied away for a loud penalty shout backed up by Tony Hudd on the radio after Harding manhandled Lloyd Sam, then after a Bailey cross was only flicked goalwards by Burton, he disallowed Shelvey's close range finish and then I was up of my arse again when the flag went up for offside after we all thought Burton had put us ahead. The common feeling from those in the ground was this was definitely a goal. We kept probing but after 'only' 4 minutes were added on for injury time the impetus had switched to the Saints in the final minutes and I was more than pleased to get a point. This game was always potentially a banana skin with memories of the past becoming more important than the present, so I for one am glad it is over and we can move on to next week still unbeaten, and still top. Come on you reds. Reports: Blackheath Addicted; Drinking During the Game; BBC Blog; Doctor Kish; Stickleback; Addicks Diary; Croydon Addick; Charlton Athletic Online; Deepest Darkest. I got back to Bermuda Monday night and that will be my last travelling for somewhile until we instill the travel bug into Chicago Addick Junior and get her a passport. It was great to be able to shoot home for a few days although sadness crept quickly over me as my son and I said farewell on Sunday evening. The weather here I think is still stifingly uncomfortable but with apologies to my English and Chicagoan friends it will only improve and the autumn here is beautiful as we lose the humidity and the houses start to cool down a bit. The thick stone walls and low sloping roofs contain heat and old fashioned air conditioning does bugger all to cool rooms down. The media have widely reported today that Michael Turner's transfer from Hull City to Sunderland will net Charlton £1m after the club agreed to roll over the sell-on amount due by the Bees when Turner was sold to Hull in 2006. The Evening Standard looks to have copied my post from the other day, but has Andrew Mills, now working at Brentford quoted as confirming the windfall for both clubs. Saturday's opponents Brentford will gain around £750,000 from the deadline day deal, although until the 'undisclosed' fee is ratified neither club will have a final number. Last week I was in the port town of New Haven in Connecticut and today when browsing through the 'things to do' collection of leaflets at my parents house, another por t town called Newhaven, but this one in East Sussex jumped out of the pile and in particular Newhaven Fort. One of Palmerston's Victorian fortifications, it was one of the largest ever defences built on the south coast and as today marked the 70th anniversery of the outbreak of World War II our day's plan was settled. Newhaven itself is pretty industrial and is mostly known for the twice daily Dieppe ferry and less conspicuously being the town in which Lord Lucan's car was found in 1974. Newhaven has a kind of sullen look but new flats have been built down on the West Quay harbourfront offering signs of encouragement, but for £180,000 the view of the ferry and a scrap metal merchant across the quay wasn't the best water view I have ever laid my eyes on. 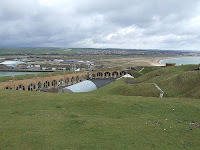 But it Newhaven Fort that we had come to see and after suffering years of neglect, at one time owned by a developer who planned to turn it into a holiday camp, the fort was lovingly restored and re-opened in 2000. There is a large range of exhibitions and audio presentations mostly within the fortific ation's ramparts but there's also a warren of echoing tunnels built into chalk cliffs to explore. Climb up on top of the ramparts and the views are magnificent. The boisterous English Channel was crashing into the harbour arm with the lighthouse isolated on the end. The view then carries around the coast to pretty Seaford and it's white cliff. 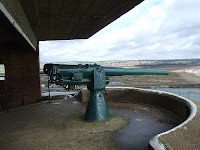 Stand in the gun emplacement and pretend the fire at the Dieppe ferry like I did, sorry I mean my son did or just admire the South Downs and the River Ouse that cuts through it. Newhaven Fort also had a nice little cafe located away from the winds in a mocked-up air-raid shelter. It was £5.85 to get in and kids under 15 were £3.80. Sodje, Holden, McKenzie in. Moots and Fleetwood out and no one else! 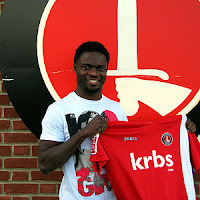 The Official Site has ran out of batteries but fear not it has been confirmed that Sam Sodje has signed. "Charlton is my club and I can't wait to get going," the big fella said. It is on the OS but it is as slow as Ralph Milne. The article doesn't say how long the contract is for. The big news today of course was that no one left, which is a huge lift to Parkinson, the coaching staff and all of us. When I say no one I mean not Shelvey, Bailey, Sam or Racon. Moots went to Jim Gannon's Motherwell on loan for 6 months, hopefully Lanarkshire will see the very best of the Frenchman. All the very best of luck Yassin. Stuart Fleetwood moved on a season's loan to Exeter City, who a while back had a £50,000 offer turned down. Signed to replace Fleetwood and compete for a first team berth with Dickson and McLeod, who surprisingly both remain in SE7 is Leon McKenzie. The 31-year old striker left Coventry in the summer and was out of contract. At times during his career McKenzie has hit some very fine form at both Peterborough and Coventry but he has also had his injury problems, particularly in the past two seasons. His goal record is over a 100 in roughly 250 starts though, not bad but he has come of the bench over 100 times. McKenzie has probably been signed as a back up/competition to Burton and agreed a one-year deal. Earlier in the day after a fee could not be settled on (or perhaps sanctioned by the current or future board?) Luke Holden signed from Rhyl on an initial loan until the year end, with an agreement to potentially make it permanent.